Includes FREE Door to Door Chauffeur Service or Parking! Lead Passengers must be over 50 - companions over 40. Dover is a town and major ferry port in the home county of Kent, in South East England. It faces France across the narrowest part of the English Channel, and lies south-east of Canterbury; east of Kent's administrative capital Maidstone; and north-east along the coastline from Dungeness and Hastings. The town is the administrative centre of the Dover District and home of the Dover Calais ferry through the Port of Dover. The area of La Rochelle is picturesque and quite warm throughout the year due to the influence of the Gulf Stream waters, on a par with the French Riviera on the Mediterranean Southern coast of France. Bordeaux is a port city on the Garonne River in southwest France. Bordeaux is the world's major wine industry capital. It is home to the world's main wine fair. Bordeaux wine has been produced in the region since the eighth century. Gijón is a coastal industrial city and a municipality in the autonomous community of Asturias in Spain. Early mediaeval texts mention it as "Gigia". It was an important regional Roman city, although the area has been settled since earliest history. The name was originally applied to a small peninsula presently referred to as Cimadevilla, literally "top of village," between two beaches, one of which has a recreational port today. Saint-Malo is a walled port city in Brittany in northwestern France on the English Channel. It is a sub-prefecture of the Ille-et-Vilaine. Private Chauffeur service in the UK up to 75m each way. Shared Chauffeur service 76m-250m each way. Further - Supplements apply. Exclusively for over 50s (a travelling companion can be over 40). Optional Saga Travel Insurance not included - this can be added - please call for details. 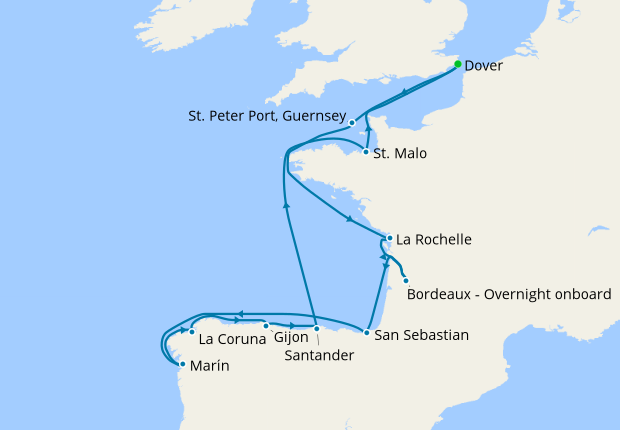 When Le Havre (Paris) is showing in any Saga itinerary, Paris will be at customers own expense, and there is no guarantee that Saga will provide any optional excursion.